The Indianapolis 500 is an automobile race held annually at Indianapolis Motor Speedway in Speedway, Indiana, an enclave suburb of Indianapolis, Indiana. The event is held over Memorial Day weekend in late May. It is contested as part of the Verizon IndyCar Series, the top level of American Championship Car racing, an open-wheel formula colloquially known as "Indy Car Racing". 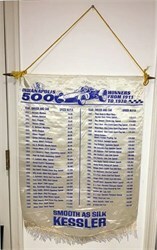 The name of the race is often shortened to Indy 500. The event, billed as The Greatest Spectacle in Racing, is considered part of the Triple Crown of Motorsport, which comprises three of the most prestigious motorsports events in the world, also including the Monaco Grand Prix and the 24 Hours of Le Mans. The official attendance is not disclosed by Speedway management, but the permanent seating capacity is upwards of 250,000, and infield patrons raise the race-day attendance to approximately 300,000. The inaugural race was held in 1911 and was won by Ray Harroun. The event celebrated its 100th anniversary in 2011, and the 100th running was held in 2016. Takuma Sato is the current champion. The most successful drivers are A. J. Foyt, Al Unser Sr., and Rick Mears, each of whom have won the race four times. The active driver with the most victories is H閘io Castroneves, with three. Rick Mears holds the record for most career pole positions with six. The most successful car owner is Roger Penske, owner of Team Penske, which has 16 total wins and 17 poles.